There has been much speculation about the comet Elenin as to whether it poses any kind of threat to the Earth. Comet Elenin is coming to the inner-solar system this fall. Comet Elenin (also known by its astronomical name C/2010 X1), was first detected on Dec. 10, 2010 by Leonid Elenin, an observer in Lyubertsy, Russia, who made the discovery "remotely" using the ISON-NM observatory near Mayhill, New Mexico. At the time of the discovery, the comet was about 647 million kilometers (401 million miles) from Earth. Over the past four-and-a-half months, the comet has – as comets do – closed the distance to Earth's vicinity as it makes its way closer to perihelion (its closest point to the sun). 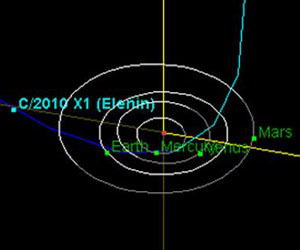 As of May 4, Elenin's distance is about 274 million kilometers (170 million miles). "We're talking about how a comet looks as it safely flies past us," said Yeomans. "Some cometary visitors arriving from beyond the planetary region – like Hale-Bopp in 1997 -- have really lit up the night sky where you can see them easily with the naked eye as they safely transit the inner-solar system. But Elenin is trending toward the other end of the spectrum. You'll probably need a good pair of binoculars, clear skies, and a dark, secluded location to see it even on its brightest night." What about this celestial object inspiring some shifting of the tides or even tectonic plates here on Earth? There have been some incorrect Internet speculations that external forces could cause comet Elenin to come closer. "Comet Elenin will not encounter any dark bodies that could perturb its orbit, nor will it influence us in any way here on Earth," said Yeomans. "It will get no closer to Earth than 35 million kilometers about 22 million miles. " "This comet may not put on a great show. Just as certainly, it will not cause any disruptions here on Earth. But there is a cause to marvel," said Yeomans. "This intrepid little traveler will offer astronomers a chance to study a relatively young comet that came here from well beyond our solar system's planetary region. After a short while, it will be headed back out again, and we will not see or hear from Elenin for thousands of years. That's pretty cool." The Near-Earth Object Observations Program, commonly called "Spaceguard," discovers these objects, characterizes a subset of them, and predicts their paths to determine if any could be potentially hazardous to our planet. Is Elenin Really Causing Earthquakes? A considerable number of people around the world are beginning to think so. Some are saying that each time Elenin is aligned with Earth and a planet, a major earthquake occurs. There are also those that claim that Elenin is triggering changes in our weather and possibly even a pole shift. These are of course many opinions about and scientists do not agree with these speculative arguments. The official view at this point in time is that Elenin will have no effect at all and will pass by harmlessly as it will have no significant gravitational pull. Well we do not have long to wait for an answer!